Twisted uses the Deferred object to manage the callback sequence. The client application attaches a series of functions to the deferred to be called in order when the results of the asynchronous request are available (this series of functions is known as a series of callbacks , or a callback chain ), together with a series of functions to be called if there is an error in the asynchronous request (known as a series of errbacks or an**errback chain** ). The asynchronous library code calls the first callback when the result is available, or the first errback when an error occurs, and the Deferred object then hands the results of each callback or errback function to the next function in the chain. print "Nowhere to put results"
self.d in the gotResults method. Before the Deferred is fired with a result or an error, the attribute is set to None so that the Getter instance no longer has a reference to the Deferred about to be fired. This has several benefits. First, it avoids any chance Getter.gotResults will accidentally fire the same Deferred more than once (which would result in an AlreadyCalledError exception). Second, it allows a callback on that Deferred to call Getter.getDummyData (which sets a new value for the d attribute) without causing problems. Third, it makes the Python garbage collector’s job easier by eliminating a reference cycle. Deferred object triggers previously-added (call/err)back with the result or failure . Execution then follows the following rules, going down the chain of callbacks to be processed. Note: If an errback doesn’t return anything, then it effectively returns None , meaning that callbacks will continue to be executed after this errback. This may not be what you expect to happen, so be careful. Make sure your errbacks return a Failure (probably the one that was passed to it), or a meaningful return value for the next callback. If none of arguments passed to failure.trap match the error encapsulated in that Failure , then it re-raises the error. If an error occurs in callback1 , then for Case 1 errback1 will be called with the failure. For Case 2, errback2 will be called. Be careful with your callbacks and errbacks. What this means in a practical sense is in Case 1, the callback in line A will handle a success condition from getDeferredFromSomewhere , and the errback in line B will handle any errors that occur from either the upstream source, or that occur in A . In Case 2, the errback in line C will only handle an error condition raised by getDeferredFromSomewhere , it will not do any handling of errors raised in callback1 . However, it assumes that isValidUser returns immediately, whereas isValidUser may actually authenticate the user asynchronously and return a Deferred. It is possible to adapt this trivial user authentication code to accept either a synchronous isValidUser or an asynchronous isValidUser , allowing the library to handle either type of function. It is, however, also possible to adapt synchronous functions to return Deferreds. This section describes both alternatives: handling functions that might be synchronous or asynchronous in the library function (authenticateUser ) or in the application code. Now isValidUser could be either synchronousIsValidUser or asynchronousIsValidUser . Obviously (I hope), startConnecting is meant to be called by some UI element that lets the user choose what host to connect to and then constructs an appropriate endpoint (perhaps using twisted.internet.endpoints.clientFromString ). Then, a cancel button, or similar, is hooked up to the cancelClicked . You may notice that that set of consequences is very heavily qualified. Although cancellation indicates the calling API’s desire for the underlying operation to be stopped, the underlying operation cannot necessarily react immediately. Even in this very simple example, there is already one thing that might not be interruptable: platform-native name resolution blocks, and therefore needs to be executed in a thread; the connection operation can’t be cancelled if it’s stuck waiting for a name to be resolved in this manner. So, the Deferred that you are cancelling may not callback or errback right away. A Deferred may wait upon another Deferred at any point in its callback chain (see “Handling...asynchronous results”, above). There’s no way for a particular point in the callback chain to know if everything is finished. Since multiple layers of the callback chain may wish to cancel the same Deferred, any layer may call .cancel() at any time. The .cancel() method never raises any exception or returns any value; you may call it repeatedly, even on a Deferred which has already fired, or which has no remaining callbacks. Calling cancel() will always succeed without an error regardless of whether or not cancellation was possible. In cases 1 and 2 the``Deferred`` may well errback with a``twisted.internet.defer.CancelledError`` while the underlying operation continues. Deferred s that support cancellation should document what they do when cancelled, if they are uncancellable in certain edge cases, etc.. If the cancelled Deferred is waiting on another``Deferred`` , the cancellation will be forwarded to the other``Deferred`` . A caller of an API that receives operation may call``cancel`` on it. Since operation does not have a cancellation function, one of two things will happen. If operationDone has not yet been invoked, then``operation`` will be immediately errbacked with a``CancelledError`` . However, once it’s cancelled, there’s no way to tell operationDone not to run; it will eventually call operation.callback later. In normal operation, issuing callback on a Deferred that has already called back results in an AlreadyCalledError , and this would cause an ugly traceback that could not be caught. Therefore,``.callback`` can be invoked exactly once, causing a no-op, on a``Deferred`` which has been cancelled but has no canceller. If you call it multiple times, you will still get an AlreadyCalledError exception. Now if someone calls cancel() on the Deferred returned from HTTPClient.request() , the HTTP request will be cancelled (assuming it’s not too late to do so). Care should be taken not to``callback()`` a Deferred that has already been cancelled. A standard DeferredList will never call errback, but failures in Deferreds passed to a DeferredList will still errback unless consumeErrors is passed True . See below for more details about this and other flags which modify the behavior of DeferredList. DeferredList accepts three keyword arguments that modify its behaviour:fireOnOneCallback , fireOnOneErrback and consumeErrors . If fireOnOneCallback is set, the DeferredList will immediately call its callback as soon as any of its Deferreds call their callback. Similarly, fireOnOneErrback will call errback as soon as any of the Deferreds call their errback. Note that DeferredList is still one-shot, like ordinary Deferreds, so after a callback or errback has been called the DeferredList will do nothing further (it will just silently ignore any other results from its Deferreds). The consumeErrors argument will stop the DeferredList from propagating any errors along the callback chains of any Deferreds it contains (usually creating a DeferredList has no effect on the results passed along the callbacks and errbacks of their Deferreds). Stopping errors at the DeferredList with this option will prevent “Unhandled error in Deferred” warnings from the Deferreds it contains without needing to add extra errbacks  . Passing a true value for the consumeErrors parameter will not change the behavior of fireOnOneCallback or fireOnOneErrback . The consumeErrors argument has the same meaning as it does for NEEDS A TITLE : if true, it causes``gatherResults`` to consume any errors in the passed-in Deferreds. Always use this argument unless you are adding further callbacks or errbacks to the passed-in Deferreds, or unless you know that they will not fail. Otherwise, a failure will result in an unhandled error being logged by Twisted. This argument is available since Twisted 11.1.0. There is a parallel overview of functions used by the Deferred’s creator in Generating Deferreds . This is the method you will use to interact with Deferred. 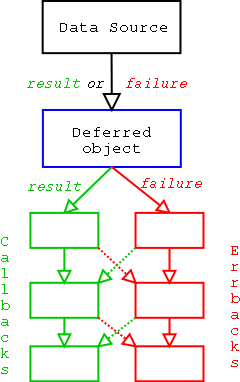 It adds a pair of callbacks “parallel” to each other (see diagram above) in the list of callbacks made when the Deferred is called back to. The signature of a method added using addCallbacks should be myMethod(result, *methodArgs, **methodKeywords) . If your method is passed in the callback slot, for example, all arguments in the tuple callbackArgs will be passed as *methodArgs to your method. Generating Deferreds , an introduction to writing asynchronous functions that return Deferreds.